If you’re on the lookout for camper trailers for sale in Australia, you may find yourself feeling overwhelmed by the choices available and not know where to start. Anyone who’s new to the world of off road campers needs to learn about the main types of campers and the differences between them in order to choose the right camper for their needs. This article will provide useful information on the main types of camper trailers for sale as well as look at some factors you should take into consideration before making a purchase. When it comes to camper trailers, there are two main types available – the hard floor variety and the soft floor variety. Which one you select will depend on a range of factors. As the name suggests, hard floor campers have just that – a hard floor. While they’re usually more expensive than soft floor trailers, the price tag for many is justified. Hard floor camper trailers are much quicker and easier to set up as well as easier to clean than soft floor camper trailers. However, they are a bit heavier than soft floor trailers, and they usually have less storage space. This means they might not be the best choice for those with cars with a small towing capacity. Those who want lots of storage space should give serious consideration to soft floor campers when looking at camper trailers for sale. Soft floor campers boast a range of benefits, and their lower price is certainly one of the main advantages. They’re typically cheaper than hard floor models, so if finances are a significant factor, then a soft floor camper will most likely be the best way to go. In addition to them being cheaper to buy outright, soft floor campers can save you money when it comes to transportation costs, as they’re much lighter and therefore require less fuel to tow. 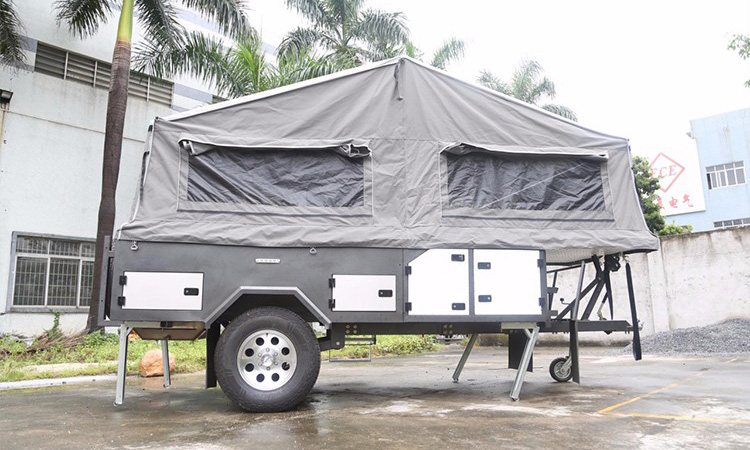 Soft floor campers are fairly easy to set up and can even be set up on on ground that isn’t perfectly flat, making them ideal for those who plan on visiting places that are off the beaten track. If you think you’ll need to carry a lot of equipment around, such as diving gear, sleeping bags, clothing or other outdoor equipment, then regardless of the type of camper trailer you choose, it’s important to make sure it has plenty of storage room. Remember that it’s always better to have too much room as opposed to not enough. Before making a purchase, it’s important to take into consideration what the off road camper is going to be used for, as this – along with your financial situation – will largely dictate which camper you end up buying. It’s also important to remember that when you’re looking for camper trailers for sale, the dealer you choose should have a solid reputation for providing not only quality trailers, but also providing excellent after sales service.